MANUU D.Ed Entrance Test 2019 - MANUU D.Ed, B.Ed, M.Ed, M.Phil, Ph.D Entrance Tests 2019: Maulana Azad National Urdu University(MANUU) D.Ed, B.Ed, M.Ed, M.Phil and Ph.DAdmission 2019-2020 Notification Released in April and The University invites online applications from the eligible candidates for admission into education courses for the academic year 2019-2020. Education is the fundamental right of every child in our country. The aim of education is to fulfill the basic learning gaps with the active participation of the community. The objective of the School of Education and Training is to prepare teachers for the elementary, secondary and senior secondary schools by training them and to prepare teacher – educators for the teacher training colleges. The network of Colleges of Teacher Education is spread across the country, supported with a research department at main campus in Hyderabad, in order to promote quality teacher education with proper value orientation. It works closely with the Urdu speaking milieu and evolves strategies to empower them by imparting qualitative and modern education at affordable cost. The School aims at imparting quality education through Urdu medium at different levels of teacher education including Doctoral programs. It provides logistic support for promoting excellence, innovative techniques and approaches, the teaching skill up-gradation providing pedagogical training to the prospective teachers and to produce competent and committed teachers and leaders for the nation. The School offers Diploma in Elementary Education (D.El.Ed. ), Bachelor of Education (B.Ed. ), Master of Education (M.Ed. ), M.Phil. 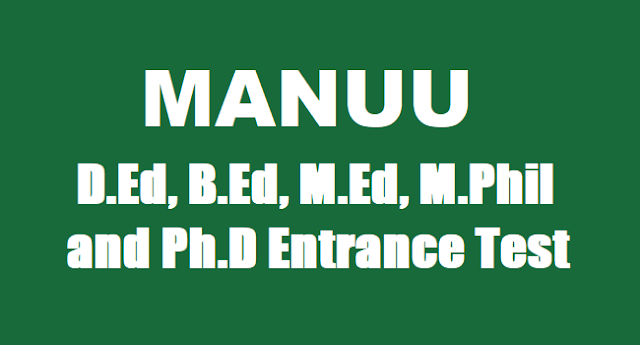 and Ph.D programs through Urdu medium in the Department of Education and Training at MANUU Headquarters. B.Ed. course is also offered in its six constituent Colleges of Teacher Education located at Drabhanga (Bihar), Bhopal (MP), Srinagar (J & K), Asansol (WB), Aurangabad (MS) and Sambal (UP). Further M.Ed. course is also offered at Colleges of Teacher Education at Srinagar (J & K), Bhopal (MP), and Drabhanga (Bihar). The research focus of the Department is on Teacher Education, Minorities Education, Madarsa Education, Distance Education, Inclusive Education, Environmental Education, Technology in Education, and Comparative Education. 2. Ph.D. (Education) at Dept. of Education & Training, University Campus, Hyderabad. A. For D.Ed Course: The Candidates with not less than 50% marks in Senior Secondary School / Intermediate /10+2 (except Vocational Programs). The candidate should have studied Urdu at 10th or 10+2 level. The candidate should have studied Urdu at 10th or 10+2 or at Graduation level. Candidates with not less than 50% marks in B.Ed. from a recognized University. Candidate should have studied Urdu at 10th or 10+2 or at Graduation level. 1. Candidates who have appeared at B.Ed./Degree/Intermediate Final year and are awaiting for their results are also eligible to write the Entrance Test for M.Ed./B.Ed/D.El.Ed. respectively, However they have to produce their mark sheets and Provisional certificate at the time of counselling. 2. There shall be a relaxation of 5 % marks in favour of SC/ST/OBC/PWD Candidates in the qualifying examination. 3. The admission committee will examine the eligibility criteria of candidates who are not covered above. However, the decision of the admission committee will be final in all the admission related matters. 4. At the time of counselling all original certificates and other relevant documents will be verified. 5. An applicant seeking admission into Ph.D. should take leave for a period of minimum of two years if working and if not working should give an undertaking to the effect that he / she is not working. 6. Candidates with the following qualifications are not eligible for admission in to B.Ed. Program: BDS/MBBS/B.Arch/B.V.Sc./BHMS/BUMS/BAMS and 5 years integrated law graduates. The Candidates seeking admission for campus based professional and Post Graduate programs should not exceed the age of 28 years for men and 31 years for women on the last date of admission for the program. University allows age relaxation of 5 years in case of SC/ST candidates, 3 years in case of OBCs and 10 years for PWD candidates. How to pay application fee: After filling the basic information online, a challan will be generated, take printout of the challan and pay the prescribed fee (printed on challan) at any branch of State Bank of India. The scanned copy of challan with details of fee and journal number need to be attached as soft copy while completing the application form online. 1. Candidates desirous of applying for more than one program need to apply separately for each program. 2. Please check the eligibility criteria for the programs (may refer Prospectus 2017-18) before applying. 3. Those completing their final examinations in qualifying examinations by June 2014 can also apply. 4. Before applying online, please be ready with soft copy of the photograph of the applicant (a scanned digital image), scanned signature, scanned receipt of fee paid through challan and relevant certificate in case of SC/ST/OBC category and PWD. 5. Online filling up of the form: After filling the online application form, the computer will generate application number (User name) and password. Follow the instructions generated from the computer. M.Phil and Ph.D candidates need to upload the research proposal in soft format with the application form. sir, when is b.ed distance entrance exam date?